The morning of 16th March 2006 offered a perfect ending for skiing holiday week for Hinkka family, when a magnificent diamond dust halo display interrupted their outdoor activities near Himos ski resort. Markku Hinkka drew camera out and started shooting the sight. According to his story at least a 120° parhelion along with bunch of other halos was in the sky. However, he did not photograph these due to their less appealing appearence compared to the halos in the vicinity of the Sun. Markku describes the weather being windless and "very foggy". The temperature was around -10°C. 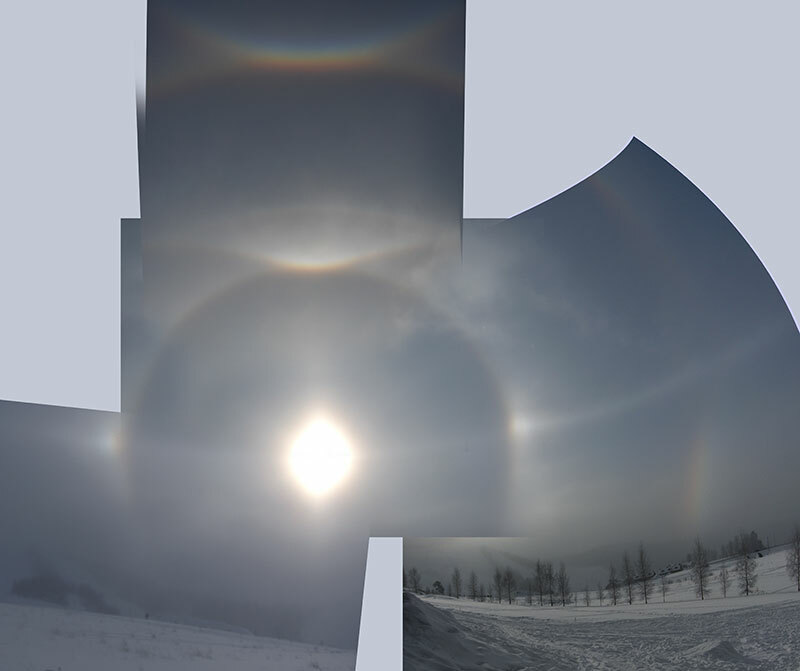 The snowguns were in operation and the halo was visible at least from a distance of 150 m up to 1,5 km from them. The accompanying image is a collage of several individual photos taken by Markku Hinkka. In the process of making the collage the perspectives of some original photos have been twisted in a very violent manner. In this case the purely illustrative purposes justified the manipulative actions, but if any measurements or comparisons with simulations are intended, such twistings are highly inappropriate. The writer takes full responsibility for these twists. I've been thinking of combining halo mosaics with automatic 2D panorama software like autostitch, that create panoramas "without any user input whatsoever". I just haven't got images to test it with, so it might or might not be suitable for halo images. Good display and good panorama work from Jukka. And 16th March is really late in the season for diamond dust. So, Kuusankoski can have easily been in dust, it occurred in the same morning hours as this one (9 to 10). I experimented with that tool Lauri. It works for halos only as long as there are ground objects in the frames. And even then it may make for example light pillars inclined. It is rather useless to work with halos. I see. Apparently halos are not clear enough to be used as points of reference for automatic panoramas. A panorama software with alignment of sky images would certainly be nice. It would be useful for example to create correct fisheye projection mosaics taken with mobile phone cameras etc.